Eight persons, A through H, were sitting around a circular table with eight equally spaced chairs. There are exactly four married couples among the eight. Among the eight persons, A, D, E and F are males, while the rest are females. Each person wore a dress of a colour among Red, Blue and Green. it is known that any two persons wearing a dress of the same colour neither sit adjacent to each other nor sit opposite each other. Further, any two persons married to each other do not wear a dress of the same colour, do not sit adjacent to each other and do not sit opposite each other. A, who was wearing a Green dress, was sitting opposite C, while E, who was wearing a Blue dress, was sitting opposite G.
H is the spouse of F, while D, who was not wearing a Red dress, is not the spouse of G.
B, who was wearing a Green dress, was sitting to the left of C and to the right of the spouse of C.
Q1. Who among the following is definitely sitting adjacent to F? Q2. What is the colour of the dress of the spouse of D? Q3. Both the persons sitting adjacent to which of the following persons are wearing a dress of the same colour? Q4. The spouse of which of the following persons is wearing a Red dress? Given that A was sitting opposite C and E was sitting opposite G. A's spouse cannot be C (since C is opposite A), H (from (ii)). Hence, A’s spouse can be B or G.
D's spouse cannot be G or H. Hence, D’s spouse can be B or C. E's spouse also can be B or C. Since G cannot be the spouse of D or E, G has to be the spouse of A. 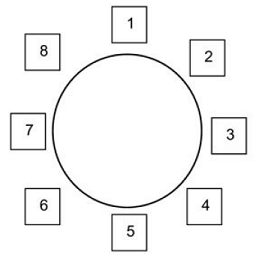 Let the following diagram represent the chairs around the table: Let A be at 1. and C be at 5. From (iii). B will be at 6. If D's spouse is C. B and E will be married to each other. From (iii). D will be at 7. Since E and G must be opposite each other, they must be at 8 and 4 (G cannot be at 8 as she will be sitting next to his spouse. A). In this case. F and H will have to sit at 2 and 3. This will violate the given information as a married couple cannot sit next to each other. Hence. D’s spouse cannot be C.
If E‘s spouse is C. D will be married to B. in this case, E will be at 7 and G will be at 3 (from (i)). Also, A and B are wearing Green dresses. E is wearing Blue dress. C cannot be wearing a Green dress (since she is opposite A) and cannot be wearing a Blue dress (since she is married to E). Hence. C will be wearing a Red dress. G cannot weat a Blue dress (since she is opposite E) and cannot wear a Green dress (since she is married to A).Hence. G must wear a Red dress. If D is in 2. F and H will be opposite each other. Hence. D cannot be in 2. If D is in 8, D must be wearing a Red dress (since A and E. who are adjacent to D. are wearing a Green dress and a Blue dress respectively). This will violate (ii) and hence. D must be in 4. wearing a Blue dress (since D’s spouse. B, is wearing a Green dress). F and H will be in 8 and 2 in any order. This is the only possible case.